Narendra Modi keeping his enthusiasm on foreign trips to present new young bold dynamic India playing “MORIN KHURR” as representing his country and as he puts his legendry words front of the peoples, he by playing and accepting the dress code too of Mongolia played Morin Khurr on his Mongolian trip. 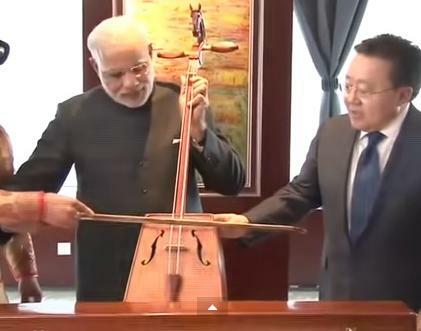 Narendra Modi on his magnolia trip in a sky blue dress and a white Mongolian cap played a cultural instrument of Mongolia MORIN KHURR to show his inclination in music and culture too. AS MORIN KHURR is a Mongolian ancient cultural instrument that is mainly from eastern Mongolia. The meaning of MORIN KHURR as Mongolian culture says is “fiddle of horse’s head” mainly made up of wooden box and wires as violin.